A gangster from the golden age of organized crime, Vic Santos was shot, execution-style by his own crew when they had decided that he was too much of a risk to work with. His body was left in the foundation of an apartment that was being built, and Vic was soon forgotten. Nearly a century later, some jerkass teenagers who live in the apartment building perform a mystic ritual as a party game that brings new life into the gangster’s corpse. 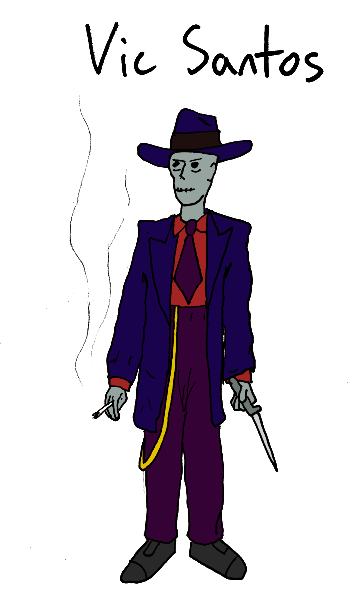 The newly awakened Vic, still bitter about the betrayal by those he once considered his friends, lashes out by killing the kids, one by one, intent on using their mystic ritual to raise them as skeletons to make a new mob loyal to him. Vic Santos is basically my attempt to create a supernatural slasher horror villain. One from the supernatural-guy-with-a-personality, like Freddy Krueger, rather than the mute Jason Voorhees variety. Vic would probably make terrible jokes after his kills (and also probably talk in outdated slang). One of the teenagers will undoubtedly be able to make him return to death, but he’ll always find a way to come back, over and over again. Traditionally, if you are bitten or scratched by a werewolf, you are cursed to become a werewolf yourself. The Yellow Werewolf is somewhat different. If it bites or scratches you, but does not kill you, you are cursed to become the Yellow Werewolf. The same one. 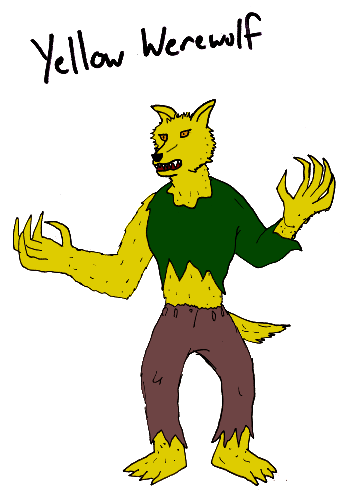 The Yellow Werewolf is a persistent intelligence that transfers from victim to victim, more like a demonic possession than your average werewolf, but it can only be active during the full moon, so it has to be extremely cunning, much less bestial, if it wants to survive. I jokingly made up the name “The Yellow Werewolf” in another character’s write-up and, never one to let something go, when I decided I wanted to do some Halloweeny characters I remembered that and decided to just go for it. 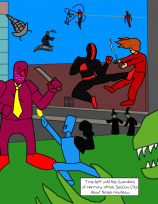 To date, this is now only the second Super Sunday character I have made whose name starts with the letter Y.